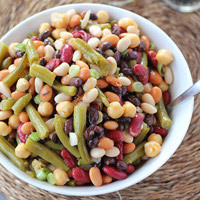 A colorful bean medley tossed in a tangy ginger dressing. Mix the oil, apricot preserves, vinegar, sugar, and ground ginger together; set aside. Put the drained beans and onion in a large bowl with a cover; add the dressing and mix. Cover and refrigerate. Turn the bowl over occasionally during the first few hours to mix the dressing and ingredients. Serve cold.